I actually posted this recipe a long time ago, but I thought it deserved better photos and another look. Spaghetti Carbonara is a dish that tends to illicit strong feelings. When I first started making the dish, I followed a Mario Batali recipe that called for cream. I now know what blasphemy that is, and have discovered what a silky consistency you can get without any butter or cream. I do include onions and garlic in my version, which some may consider unholy. But I just love the added flavor they give to the dish. 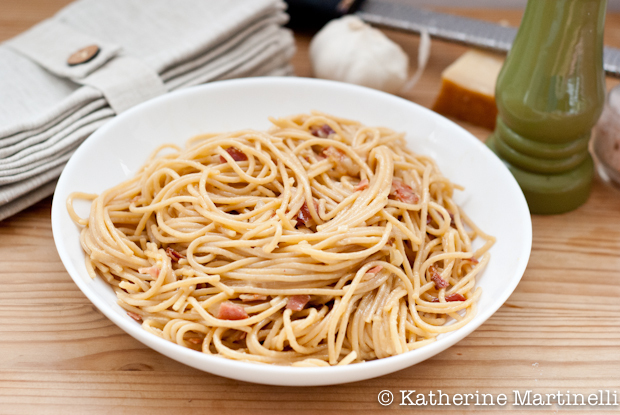 Spaghetti Carbonara is very simple to make, but there are a few tips to keep in mind. Guanciale is the pork product of choice, but pancetta is a good back-up and bacon works just fine. The truth is I make it most often with bacon. I like to chop the bacon and fry it (as opposed to frying the strips and crumbling them), and then I add the onion and garlic to that. Everything gets imbued with the rich, salty flavor and becomes just slightly crispy. The cooked spaghetti is added to this and tossed vigorously. You have to remove the pan from the heat before adding the eggs because you don’t want it too hot, but it should be hot enough that the residual heat cooks them slightly. Add the eggs one at a time and use tongs to toss as vigorously as possible. This is probably the single most important step – you want every strand of spaghetti to be coated, and you want to avoid your eggs becoming scrambled. After this parmesan, salt, pepper, and a dash of the pasta water finish things off. A classic Roman dish, Spaghetti Carbonara is the perfect weeknight meal. Just a few ingredients gets you a rich and satisfying dish. Add the bacon to a large, hot pan and cook, stirring frequently, until browned and slightly crispy. Drain some of the fat if necessary. Add the onions and garlic and cook until softened, about 8 minutes. Carefully transfer the spaghetti to the pan and toss to coat the pasta. Remove the pan from the heat and crack 1 egg over the spaghetti. Using tongs, vigorously toss the pasta until the egg is fully incorporated and the pasta is coated (if the pan is too hot or the spaghetti is not mixed vigorously enough you’ll end up with scrambled eggs). Repeat with the remaining two eggs. Add the Parmesan and toss to combine. Season with salt and pepper. The spaghetti should be fully coated and have a sheen. If it needs more moisture mix in a little pasta water at a time until the desired consistency is reached. Serve in a bowl and top with additional grated Parmesan and freshly ground pepper. To read more about #SundaySupper visit Isabel over at Family Foodie. Special thanks to Renee of Magnolia Days for hosting this week! Be sure to check out what everyone else is bringing to the table for #SundaySupper this week – we have quite an impressive and mouth-watering line-up! One of my simple pleasure a simple carbonara like this, bacon parmesan but sometimes I add cream on mine. I have been meaning to try this forever – yes, I am one of the lone souls who have never had this pasta dish. It looks delicious and I love your family photos! Simple pleasures for sure. I love this stuff. I just bought fresh laid eggs from a local farmers market. This is the perfect recipe to highlight the flavor of those fresh eggs. I do like that it does not have butter or cream (keeping it lighter). Thank you for sharing this and those wonderful photos of your family. Carbonara is one of those “foodie bucketlist” foods for me. I don’t know why I find it so intimidating, but I do. Yours looks amazing! I just need to do it!! 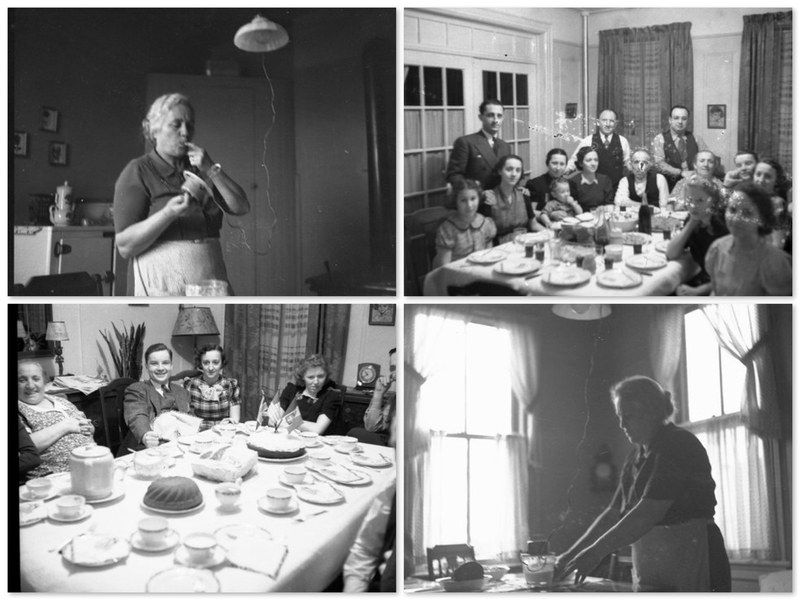 Love those photos of your Italian family – what treasures! I’m glad I’m not the only one who has never made this dish but your picture makes me want to go make it right now! Thanks for sharing!! THANK you for omitting the cream! Ahhh I scream when I see that (is that bad?) lol The first time I had REAL carbonara was actually, funny enough in the Jewish Ghetto in Rome..of course, pork in a Jewish area..lol I dont add garlic to miine..maybe I shall? since I add it to everything else lol Happy #SundaySupper! Mmmmm! I have never had Carbonara, but I am really, really wanting to try it. Thank you for posting it for Sunday Supper! I love recipes like this that call for basic ingredients. The kind of recipe you can just whip up anytime because you know you already have the ingredients in the house. Seeing all of your family photos just gives this recipe even more depth! If I’m having a rough day, I will pig out on Carbonara and add extra bacon haha I do add a little bit of cream though, so don’t tell anyone 😉 Your plate looks like yummy comfort food! Absolutely one of my faves! Will try your recipe next time I make it. So simple but packed full of flavour 😀 Im interested to try guanciale!! Wow! I love that you made this without cream. My neighbor is straight from Italy and her recipe calls for a ton of cream so I rarely ever make it. These photos are fabulous! And the pasta looks devine. Jack loves Carbonara so I’ll definitely be making this recipe. Great dish, and one I haven’t made for ages (as in, over 10 years). I know I don’t use cream in my version, although I’ve seen it in many. And I’m an onion and garlic kid, so that’s what I always use. Really nice recipe – and thanks for sharing the family pictures! I absolutely LOVE a good carbonara! In fact, I had it for dinner two nights in a row in Rome. Heaven on a plate! Oh Katherine, this is one of my favorite spaghetti! This in fact is my first spaghetti I made in my life, and happened in home and economics in junior high! I will never forget that. It’s so cool that Japanese home and economic book has this as recipe for kids to try! Thank you for sharing the pictures of your family. What great family pictures to treasure! Beautiful post with beautiful pictures and a wonderful recipe! I am so glad you shared this with us during #SundaySupper Katherine! So simple, but looks wonderful. I’ll have to try this with gluten-free pasta! Katherine, this looks delightful! Looking at this recipe, I know I’d eat a whole lot of it. Perhaps too much, if thats even possible. When I get around to making this, I’m going to do it YOUR way. Thanks for sharing this for #SundaySupper! I’m an Italian food lover and have yet to try this! Next on my list! I am drooling…This is so simple and so delicious. My kids would eat it everyday if I let them…lol! Simple pleasure, indeed. This looks so good, Katherine! Carbonara Spaghetti i love to eat on the weekend.